Australia Streets are scattered across the cities, suburbs and towns of Australia. In them generations of Australians have made their homes, expressing their sense of who they are and where they come from. These songs and tunes form part of a folk music tradition now part of that expression. 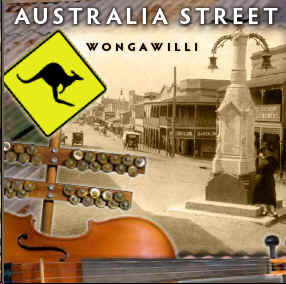 You can also purchase other Wongawilli recordings and sheet music / dance publications on this secure website. Click here to download a FAX / POSTAL ORDER FORM. The band has aimed at trying to be different from the average bush band by performing unfamiliar yet entertaining music. This formula has received national recognition with 16 awards at the Australian Bush Music Festival and Bush Band Championships. The group includes 11 year old Samuel De Santi, a wizard on the Irish bodhran since the age of 5! This set is named after Australian collector John Meredith, Merro to his friends. Stan Treacy was a fiddler from Crookwell, NSW and was visited by other collectors including Chris Sullivan, Dave de Hugard and Brad Tate. Paddy’s Schottische is from Paddy Godden of Forbes, NSW and he provided a number of great tunes to John and fellow collector Rob Willis. Rob has also done a huge job of collecting tunes and songs with the added bonus of freely sharing the material. The Wedding of Lochan McGraw comes from fiddler Joe Yates of Sofala, NSW and is based upon a song of the same name. Collected from Bill Miles, of Omeo in the 1960s by Norman O’Connor. John is a fine local singer-songwriter in the tradition of Australia's great ballad poets. He hails from Broken Hill but has the made the Illawarra his home for many years.